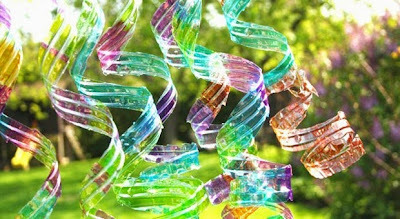 With a couple of hoses and a package of zip ties, you could create a very unique, very outdoor-friendly decorative “rug”. Seriously. This is too cool. Bright, whimsical, and very chic-looking! We love this idea. The possibilities here are virtually endless. Smaller ornaments could be arranged as a tabletop centerpiece, while larger ornaments could be placed in flower beds and along borders. This project does require a little more know-how than the previous two. 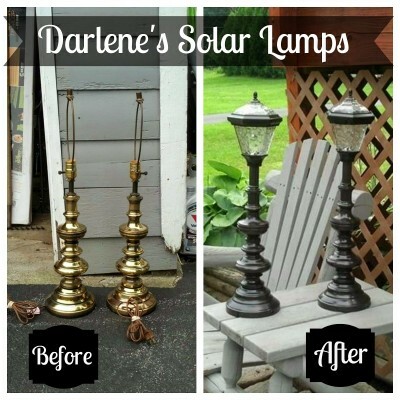 Blogger Robin at ReDo It Yourself has several fantastic examples of solar lamp upcycles as well as instructions (including photos) of how to recreate these awesome lamps for yourself. If you only choose one project from this compilation, let it be this one. We couldn’t find the source of this image (so if any of our readers know whose art this is, please comment below so we can give credit where credit is due!) but my goodness, this is stunning. 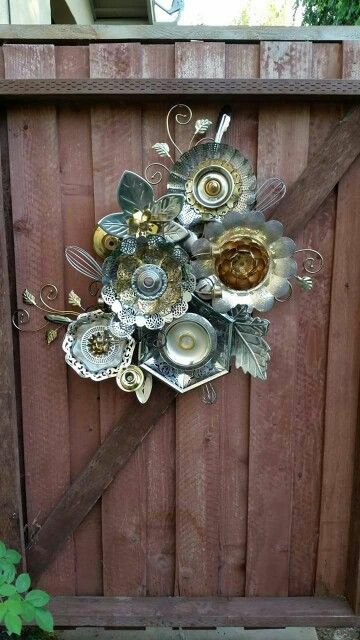 What otherwise would have been passed-over serving platters, wall sconces, and even wire whisks, have been combined to create a beautifully curated garden art piece. We could stare at it all day, truth be told. To recreate this look, we suggest using a piece of plywood as backing, and then screwing the larger bottom pieces in. The lighter top pieces can be glued in using E6000 (or similar) epoxy glue. To make sure it stays weather-resistant and doesn’t rust, spray with clear top coat (unless the rusted look is what you’re going for, in which case, don’t seal it and let mother nature get to work!). 5. Last but not least, we really like these water bottle wind spirals. Carissa at Creative Green Living writes, “While I almost exclusively use my refillable water bottle to drink from, I occasionally find myself with a leftover disposable one on my hands. If you have leftover water bottles, you and your kids can turn them into pretty yard art with a few simple supplies.” We love her creativity and think this would add the perfect touch to a whimsical outdoor space. So, how did we do? Did we convince you that credential clothing suppliers can give good advice about outdoor decor? We certainly hope so. Even if we didn’t, we hope we got your creative juices flowing. There are so many more ways to get creative outside with eco-friendly backyard projects! Forget about Paired Shoes for a Minute. Let’s Talk Trash.